Mozilla has been running a fundraiser from within its Firefox browser, a program that will run through the end of the year. When users launch Firefox they may see a PBS-style pitch for money on the browser’s start screen, which normally is a minimalist display of a search field and a few tool icons. After clicking through to the donation page, users see choices ranging from $3 to $20, and will be asked to enter their credit card or PayPal account information. Although Mozilla also accepts Bitcoin donations, those must be processed through another mechanism. The fundraiser does not appear on everyone’s Firefox start screen, nor does it show every time the browser is launched. In an FAQ, Mozilla spelled out details of the fundraiser, including what the money would be used for. “Your donations will not only enable Mozilla to continue current activities ... but will also allow us to develop new programs that will support the Mozilla community, the open Internet and to increase Web literacy,” the FAQ said. 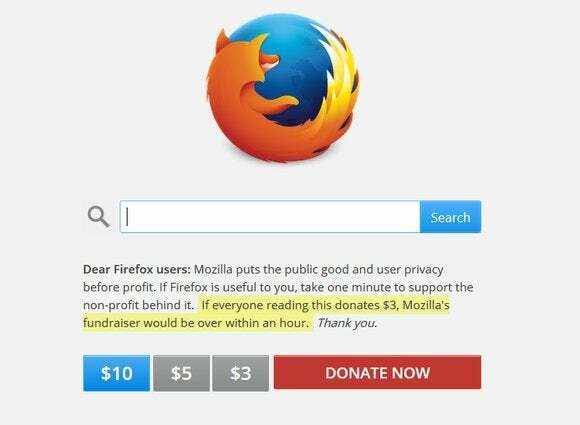 Why Mozilla felt it necessary to solicit donations, however, was not explained. Last month, Mozilla announced it had dropped Google as its global search partner and was switching to Yahoo as the default search engine for North American Firefox users. Neither organization disclosed the financial terms of the five-year deal. 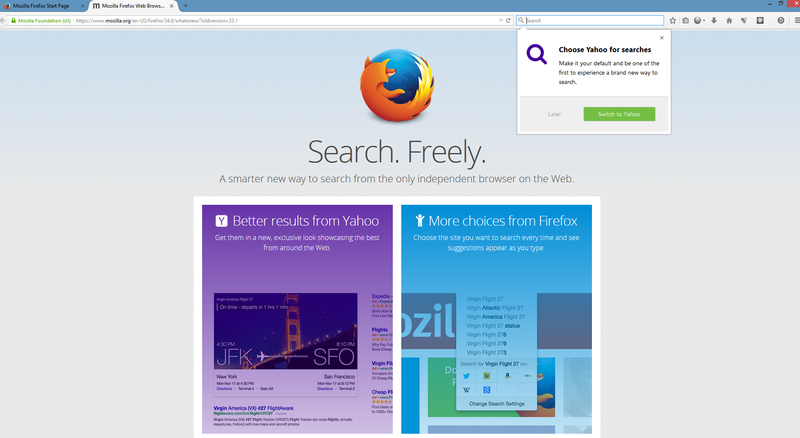 Firefox recently switched to Yahoo as its default search provider. Mozilla has been trying to diversify its revenue—the vast majority of it comes from the deals it strikes with search providers—including in-browser advertising. The push for contributions may be simply another way to wean itself from those search contracts. In 2013, the last year for which Mozilla has disclosed revenue, the non-profit said it recorded $2.3 million in contributions, a 168% increase over 2012. On its 2013 tax return, however, Mozilla used a different number, saying it had received $6.9 million in “gifts, grants, contributions and membership fees,” just 19% more than the year before. One unnamed individual gave Mozilla $1.2 million last year, while two others kicked in $833,333 and $705,824, respectively. Five more gave $300,000 or more each. Mozilla did not immediately reply to questions about the fundraiser, including the organization’s monetary goal and its reasons for soliciting users from the browser. Firefox users who want to donate to the Mozilla Foundation—and who do not see the plea in the browser—can do so from this website. This story, "Firefox in-browser fundraiser begs for cash as Mozilla scrambles to diversify income" was originally published by Computerworld.